What is a Client Hypervisor? A client hypervisor is a software layer between the operating system and the PC hardware that allows hardware resources (CPU, RAM, Disk, etc.) to be shared between multiple execution environments. A client PC has very different requirements then a server and therefore the client-focused hypervisor must have specific functions to ensure a high quality user experience. Some of these functions include sleep/power management, device pass-through and more. 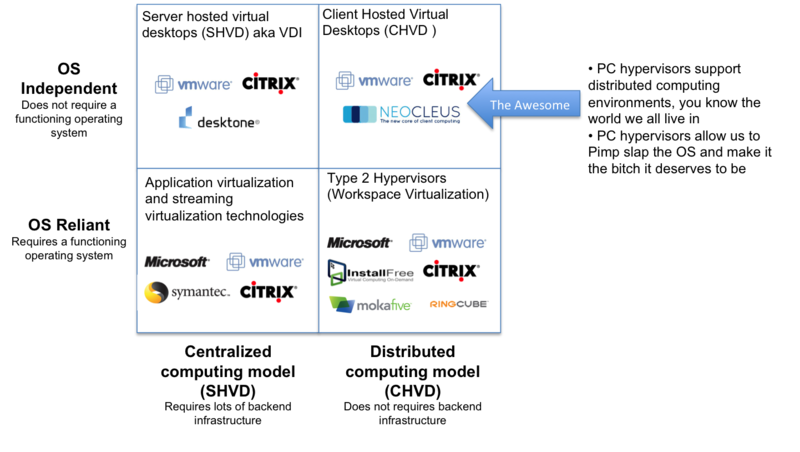 How Do Client Hosted Virtual Desktops (CHVD) differ from other forms of client virtualization? Within the client virtualization arena the nuances of how solutions are implemented are diverse. There are four key types of solutions: application virtualization, workspace virtualization (also referred to as type-2 hypervisors), client hosted virtual desktops (CHVD), and server hosted virtual desktops (SHVD) also referred to as VDI. Each method has its own benefits and drawbacks. Server Hosted Virtual Desktops (SHVD) Also referred to as VDI or desktop virtualization: Desktop virtualization as personified by VMWare’s Virtual Desktop Infrastructure (VDI), VMWare View or Citrix XenDesktop, provides the PC image to a shared server resource in the data center, the mouse and keyboard re remotely sent across the wire to the server and the results are sent to the client for rendering. Since little to no processing is occurring at the client the PC can be a machine with minimal resources (thin client). This also means that a system can be more flexible and a user can connect to the same desktop over a multitude of devices from a wide range of locations. Client-hosted virtualization (CHVD) differs from server-hosted virtualization (SHVD) in some critical ways. Where SHVD is remotely executing the OS image on a server and sending screenshots across the network, CHDV is executing te OS image locally on the client itself, taking advantage of the PCs powerful hardware. CHVD can be taken offline from the network, whereas SHVD requires a network connection. Client hosted virtual desktops fit into the trend of today’s move towards distributed computing environments with lots of mobile computing devices spread throughout the world. The scalability of a SHVD server is limited to 20-30 concurrent sessions and require a lot of backend infrastructure. CHVD relies on the PC hardware that is in place today and requires no additional infrastructure in the data center. This entry was posted in Security, Technology and tagged BigFix, citrix, Desktone, Desktop Virtualization, Installfree, Mokafive, Neocleus, ringcube, Symantec, virtual computer, Virtualization, VMWare, VMWare view, Xenclient, XenDesktop. Bookmark the permalink. Nice description of the different options. CHVD is really going to give organizations other options with desktop virtualization. The key for any solution is going to be in giving organizations the options and then allowing them to pick and choose which option(s) are the best. Thanks. I completely agree with your comment about options and also feel that most organizations will deploy and need to manage hybrid desktop environments; both SHVD and CHVD as well as their traditional environments that may be bolstered with both application and workspace virtualization solutions. There is no doubt that hosted virtual desktop are hot. And organizations are using HVDs to keep infrastructure costs low, increase internal management control of its IT systems, and support productivity from anywhere. Also, Microsoft recently released a Case-Study of an Asset Management Firm Uses Hosted Desktop Solution to Reduce IT Budget by 50 Percent. And the benefits are not only limited to Cost savings, but customers also recorded an increased workforce productivity, enhanced IT control, and greater operational flexibility.